Versioning System – Source code management via centralized or distributed version control system. Offers unlimited and secure Git and Team Foundation Version Control (TFVC) repositories. Agile project management – Enable your custom agile processes. Capture, prioritize, and track work with backlogs and customizable Kanban boards. Ensure transparency and traceability with work items linked directly to code and builds. Continuous Integration – You can completely automate the Software lifecycle by Implementing continuous integration, continuous deployment and release process. 3. 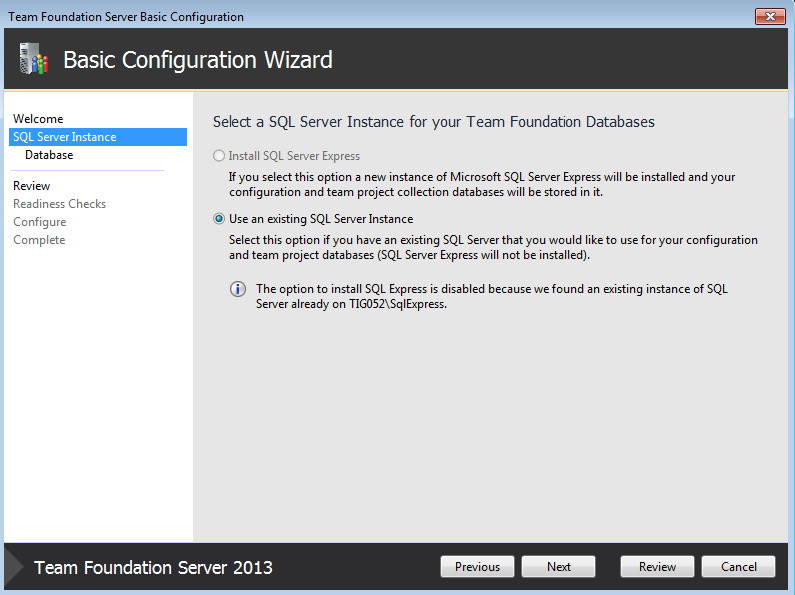 If you already have SQL Server 2012 installed, choose “Use an existing SQL Server Instance”. 6. Press Configure to continue. TFS comes with several pre-installed features with the initial setup, however, in order to use a service you are required to configure it and provide configuration parameters to make it fully functional. 1. 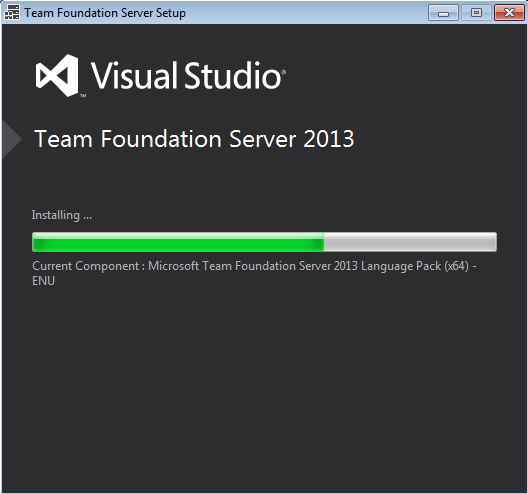 Go to Start -> Microsoft Visual Studio Team Foundation Server 2013 -> Team Foundation Server Administration Console. The following window will be opened. Click on “Configure Installed Features”. 2. Click on “Start Wizard”. 4. Keep the below settings as default and press Next. 5. Keep the “Use the default setting” selected and press Next. 6. Keep the default option selected and press Next. 7. The next window shows a review of the Build Service settings. Click on “Verify”. 9. Once the Configuration is completed, press Next. 10. Close the window once configuration is completed. 1. Go to TFS admin panel. Under Administration Tasks, click on “Manage collection security and group membership”. Click on “Project Collection Build Administrators”. 5. Select your user and click on add. 6. Change permissions and add your user to Administrators. 7. Your user needs to be added in both “Project Collection Administrators” and “Project Collection Build Administrators”. You’ll need these permissions in order to create a team project and define/configure a build. Now you have to add a project in order to establish a repository for the source code and a place for a group of developers and teams to plan, track progress, and collaborate on building software solutions. 1. Go to TFS admin console. 2. Choose the VSTS icon to open the Projects page, and then choose Create Project. 3. Fill out the form provided. Provide a name for your new project, select TFVC as the source control type, select a process, and choose with whom to share the project. 1. Download & Install Team Explorer Everywhere 2013 Eclipse Plugin. 4. Click on Connect to TFS. Select newly made project. Click on Finish. 5. Click on Source Control Explorer. 7. Click on Browse and select the files/folders that you want to commit into the TFSVC repo. The folders you add are usually the project folder of your application containing the source code and resource. Once the desired files are added, they would be displayed in the source control window. Please note that these changes are not yet checked-in into the source control. 9. Click on Check-In. These changes would be checked in into the source control. Make sure all changes are included and nothing is excluded. Once you have installed the eclipse plugin you should be able import projects from Team foundation version control repository. Once import is complete, the entire project would be checked out from the TFS server and would be displayed in eclipse. You can use eclipse to create automated builds as a part of continuous integration process. 1. Under Team Explorer view, click on Builds > New Build Definition. 2. In General, Enter build definition name and description. 3. Under Trigger tab, enter the build trigger options as per requirement. You can either build manually or can trigger a new build upon every check in. Select the desired option. Every build definition makes a project file after successfully configuring a build definition. 4. Under Source Settings, select the workspace where you want the project file to be made. 5. 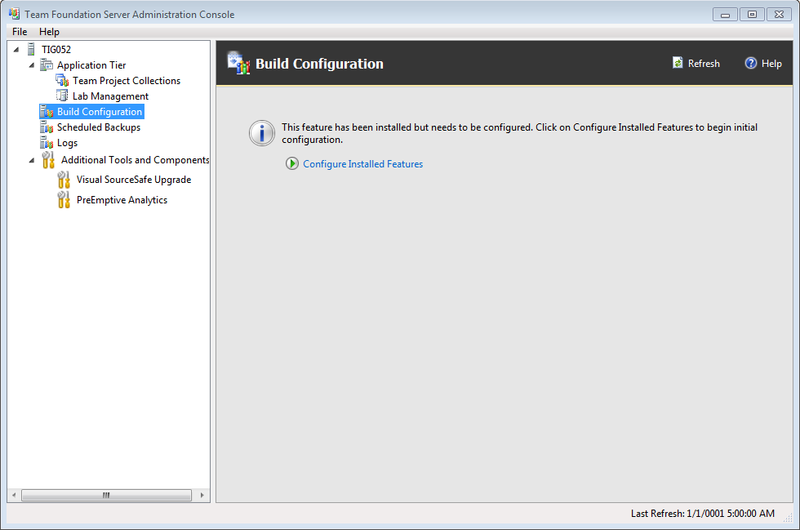 Under the Build Defaults tab, enter the Build Controller that was configured while TFS installation. 6. As mentioned earlier, a project file is needed for every Build definition. This project file requires the ANT/MAVEN build script and makes a .proj file as a result. In case a workspace already contains a project file, you can use the existing one. 7. Select whether you want to use an ANT/MAVEN build script. 9. If you have the build file committed in source control, you can select it from there. If you build script is dependent on a properties file (build.properties) then please make sure both build and properties files are placed in the same folder. 10. Choose specific versions of JAVA and ANT installed OR use Default if you already have the ANT_HOME and JAVA_HOME environment variables saved. 11. Press Finish. Specify the Retention Policy. 12. Once the build definition has been configured, you will be able to see the build definition under the All Build Definitions tab in Build view. 13. To trigger a new build, right-click on the build definition and click on Queue New Build. Once the build is in process, following will be displayed. 14. Right click on it and click on Open in External Browser. 15. Click on Logs to view the TFS logs.